After a fairly depressing few days (weeks) of battling with teenagers, I couldn’t bring myself to blog about teaching this week. Having said that, however, this morning I was at a really inspiring assembly about reading. Yes, really. And it got me thinking about where my love of all things literary came from, stories particularly. As a child, I always looked forward to bedtime stories (my love of sleep was also present from an early age), and the ones my Dad told were spectacular. He created his own stories, based around the life of a character called Freddy – a frog who lived in the pond at the bottom of our garden, had a racing driver for an uncle, and whose favourite snacks were chocolate covered flies or crispy lily pads. Therefore, in honour of my dad – and the memory of Freddy the Frog cheering up a horrible week – here are my top ten facts about frogs. Ribbit. Certain frogs can jump up to 20 times their own body length in a single leap. Frog bones form a new ring every year when the frog is hibernating, just like trees do. Scientists can count these rings to discover the age of the frog. One type of desert frog can wait as long as seven years for water by surrounding itself in a type of transparent bag that becomes its first meal once the rain comes. The golden dart frog is the most poisonous frog on earth and the skin of one frog could kill up to 1,000 people. a single touch of its skin can kill ten humans. Frogs can retract their eyes and when they do, they bulge inward in their mouths and help them swallow their food. A frog can only see moving things. It could literally starve to death with live prey in front of it if the prey never moved. The North American Wood Frog is the only species of frog found above the Arctic Circle and in winter it actually freezes, its heartbeat stops, and it thaws again in spring, coming back to life. 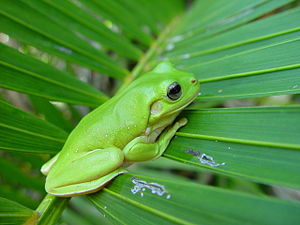 Australian Tree Frogs emit a chemical substance that heals wounds on humans.